A new species of fruit fly, the African invader (or Asian) fruit fly Bactrocera invadens, has recently invaded Africa from Sri Lanka. It had spread to more than 10 countries in Africa, including Mozambique and Namibia, where it is reported as an extremely serious fruit pest. This fruit fly is highly invasive with a high reproductive potential, and has a long list of host plants, including citrus, mango, cashew, papaya, guava, pepper, and several wild host plants. The main pathway for fruit flies to spread from one country to another is through the international movement of infested fruits. Specimens of this invasive pest were intercepted in South Africa, but timely intervention has led to successful eradication from South Africa. Fruit Fly Africa has a network of traps deployed throughout South Africa to enable early detection and further action. 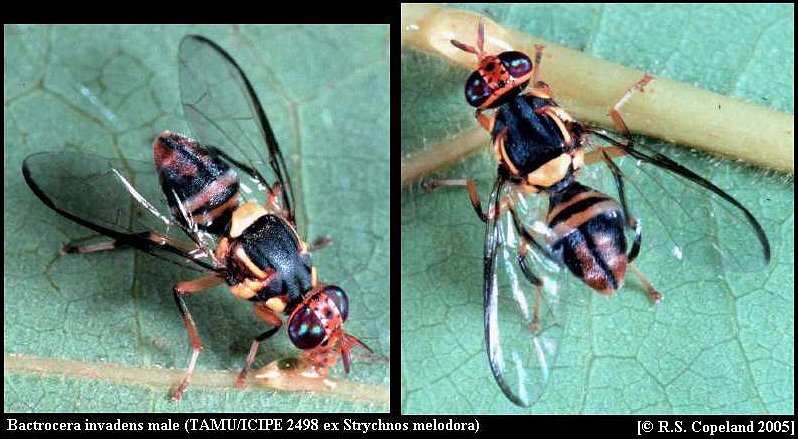 The adults of this fruit fly differ markedly from the other two species. Its base colour is blue-black with yellow patches in the mid-section, and a couple of paler stripes on the abdomen. Eyes are blue-black, and wings are clear with prominent, dark leading edges.